Tucson’s luxury real estate is beginning to sell again with five homes sold for more than $1 million in August and nine in September. Active luxury inventory in August 2012 was down 10% from August 2011 indicating that confidence is back in the market. Market analysts believe that many people who have been laying low are now thinking that this is the last opportunity to get a good deal on a home. Additionally, luxury home professionals agree that the buyers are not primarily investors rather they are local families moving up as well as people from out of state moving to Tucson for all or part of the year. Average Sales Price increased by 1.03% from $180,193 in August to $182,041 in September 2012. This means that the Tucson area real estate market is pointing toward a recovery. However, the traditional homebuyer may find it to be a very challenging time right now because homes in their price range that come on to the market can sell within 30 days, are competitively priced, and typically are sold within 24 hours. There is a slight shortage of homes on the market in September with statistics showing about four months’ worth of homes on the market right now. It is considered a balanced market when there are about six months’ worth of homes on the market. One of the most positive statistics released was in new-home permits. 148 permits were issued for single-family homes in September 2012. Analysts expect permit numbers to be about 33% above last year’s statistics by the end of the year. According to a luxury housing report, the median price of luxury sold homes was $1,200,000 for the month of September 2012, down 6% from September 2011. The past four years have seen many ups and downs, especially in the real estate market, and while the median price of luxury sold homes was down in 2012 compared to 2011, this does not necessarily mean the market is worse off. Many other factors come into play to determine the overall health of the market. 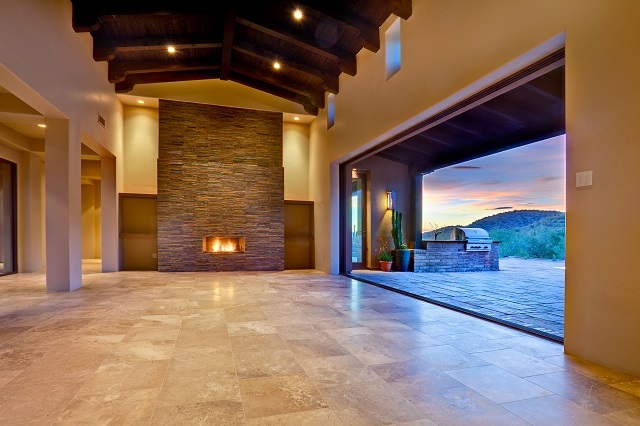 For instance, the luxury Tucson real estate market had 21 new luxury properties under contract in September 2012, up 62% from September 2011. This indicates we are in fact in recovery and on our way to eventually getting back to pre-recession levels of activity. Finally, this statistic really jumped off the page in terms of indicating a positive and strong recovery — There were 13 luxury closings in September 2012, 117% above September 2011. If you’re in the market for a piece of luxury Tucson real estate to call home, The Residences at The Ritz-Carlton®, Dove Mountain are nestled high in the Sonoran Desert and offer you spectacular vistas of towering saguaro cactus and the magnificent Tortolita mountains. Plus, once you become a lucky homeowner in this community, you can indulge in the legendary amenities offered at The Ritz Carlton, Dove Mountain hotel, whenever you like. Or explore the more than 850 acres of natural desert beauty that are perfect for hiking, biking and horseback riding. Call us today at (877) 451-7205 or request more information and discover your piece of paradise.